I want to watch a movie in only the best conditions I can. When I am on the run, I frequently just grab a laptop or a tablet, my headsets and just watch the movie or the TV show I want. It is easier to do so and I`m usually ok with this. From time to time I also go to the cinema and the overall ambiance that I see there is way better than the one I can recreate with the laptop and the headsets. This is the reason why I started making my own home movie theater. Is it expensive to make a home movie theater? This is the first question a lot of people are asking when they start building their own. I want to tell you that it isn’t expensive at all. You will only have to know what you need in order to create the perfect movie watching experience. 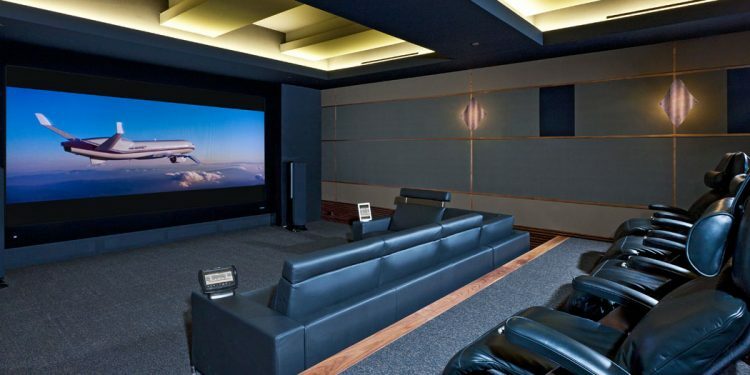 What things should you pay attention to in order to make the best home movie theater? First of, I am going to tell you a few words about this important part of your home movie theater. You will need to pay a large portion of your attention for the acoustics you create. The ceiling is an important part of the setup. The drop ceiling made of standard fiberglass tiles is your best call in order to have the movie watching experience you want. Don`t forget about the wall surface. The perfect way to make them perfect for a better movie related experience is to add some cheap, light acoustic boards to it. You will need to complete all walls first before starting the floors. The window coverings are really good in order to cover or block the light. You can try room-darkening shades for about 30$. Don’t forget about the floor coverings by using a carpet and choose colors in order to control all the reflections of the screen. Having too much lighting while you watch your movie will destroy your watching experience so take notice of this. Lower voltage lights are available for under 100$ at basically all home improvement stores out there. When we are talking about furniture you have to know that the best cinema furniture is quite expensive. In order to not spend a lot of money, you can use a couch that you already own. This is the most important aspect of the room. A projector is a much lower than the popular large flat-screen LED. You can find simple projectors with a price range between 100$-500$. The best quality signal is transmitted by HDMI or DVI so you should try out those. You will only need five small speakers and you will be ready to watch your favorite movie. Add two speakers on either side of the screen, one in the center and two in the rear corners. After you choose the desired pieces for your home movie theater you will need to build it. You will probably need someone to install the carpeting and the floor, but you can do the other things on your own.